What can I say? It’s been….what….3 or 4 months since my last blog post? I checked my stats before I hit “New Post” and was shocked to see that I still get approx. 14 hits per day. I was expecting….ZERO. But I guess that is the Life of a Working Mom….having to make decisions on where one’s time is spent. Today is my 6 month annivesary as a Working Mom. And I have the day off!! (HAHAHA) Somewhat by design…..today is also the boys’ last day of school….and I wasn’t about to give up our tradition of going somewhere fun (their choice) after I pick them up. I am, after all, a MOM first. Today’s plan….Ice Cream for lunch, and some mini-golf. Ok…..Ice Cream for Lunch….I guess I do influence their decision a bit. How have the last 6 months been? Are there any battle scars? Is everyone surviving? IMO, they have done very well. In terms of the “flow of the day”…..very little has changed. I take the kids to the bus stop or school…then I go off to work. And I am there either to pick them up from school or the bus stop. [As I feared, Lily was the only one who struggled with the transisiton.] For the most part, the kids didn’t really notice a difference. Their lunches/snacks are put together, dinners remain “normal” (maybe a few more crock-pot meals than I would normally cook), everyone was on-time to their sports games/practices. The only noticable changes are that I would have to sometimes drag them to the grocery store or some other errand after school (whereas a SAHM mom would do the errand while they were all at school), and that on the weekends I would get a pass to go run errands….Target, mall for Bday pressies, etc. What about sick kids or school activities? I have to say that my employer has been stellar. Very understanding and accomodating. In the past 6 months, we have had 2 major injuries in this house. 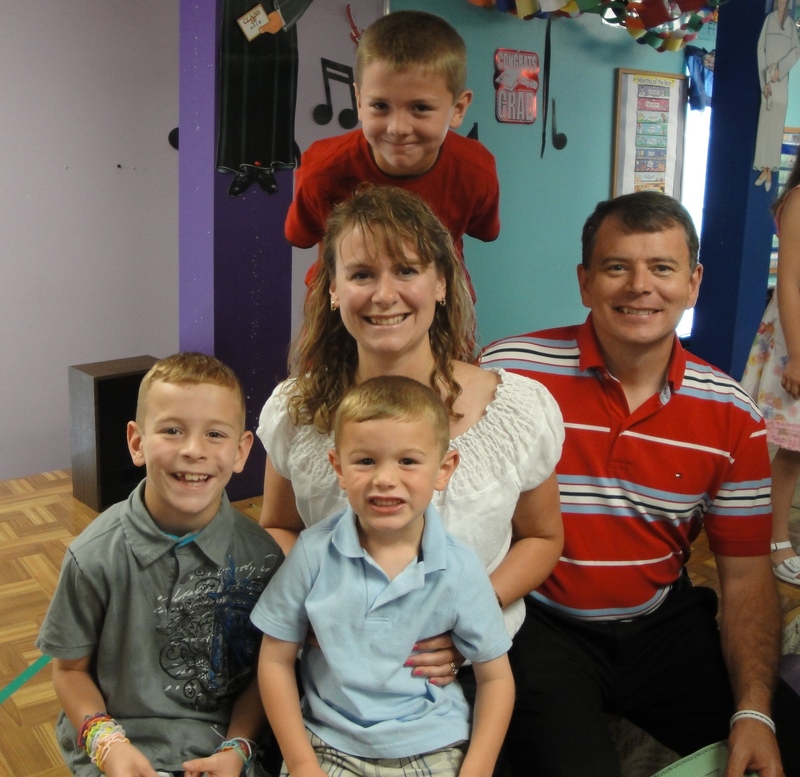 First, M-Man broke his arm in February–which required surgery, a hospital stay, and several follow-up appoinments. My supervisors were great about letting me take the time off I needed to help my son. Then in March, Hubby broke his foot….such a long story….but it required me to take up a bigger chunk of the responsibilities at home….as well as taking M-Man to the Doctor appts that Hubby had volunteered to go to. I will admit, it exhausted and overwhelmed me at times. And, I have had to make choices. As a SAHM, I attended every school function that I could. And I think if it wasn’t for the time off I took for M-Man’s injury, I think I would have made a greater effort to attend some of the events these past few months. I chose not to attend any of the boys’ spring concerts. I couldn’t volunteer for field trips. I made a choice to attend T&M’s Yearbook party rather than the “move up to Middle School” ceremony. And there is some Mommy-guilt for sending my kids to camps for vacation rather than hanging out with them and doing stuff (or not doing stuff). But I counter that with *knowing* that each summer they HAVE attended summer camps for most of the summer (this year, it just happens to be all non-traveling weeks)…Some of them are 1/2 day camps, so that makes me feel better. And again, my employer is being fantastically flexible in allowing me to work around the boys’ camps schedule. On the flip side, going back to work has been such a confidence and morale booster. On an almost-daily basis, one of my boys will ask “How was your day, Mom?” This was not a question that they asked often while I was a SAHM. I have had several of the hiring managers or directors at the agency stop by my desk and say “You are doing a great job” or “Thank you for your suggestion–it worked out great!” I have stream-lined processes and solved database problems that have plagued the department for YEARS. So here I am…..a working mom. QUESTION: What do you get when you have 3 boys, 2 skateboards, a dog, and a tennis ball all outside in February? I find M, lying on the driveway on his left side, unable to move his left arm (did I ever mention, he’s a lefty?). I get him to sit up, and I check his arms for swelling, bleeding or bruising, but I don’t see any. I move him into the basement and get him some ice, but Mommy Spidey-sense is telling me that ice isn’t going to help this one…..He’s still howling in pain. And his elbow is starting to swell. I pack the kids up and go to the local urgent care. I call my mom to get T-Man and Little Guy since it’s around dinner time, and we all know how emergency rooms can be. All in all, we didn’t wait long to be seen, or have X-rays taken. But the shocker was when the doctor came into our exam room, and without going near M-Man, looks at me at said, “I strongly suggest you take him to Children’s Hospital for evaluation rather than an orthopedic around here.” EXCUSE ME? I didn’t understand his Latin medical terminology, but I did hear surgery and pins. Oh boy. I call my mom and text hubby (who is on a plane back home) that we’re heading into Boston. Dr. Urgent Care was right. 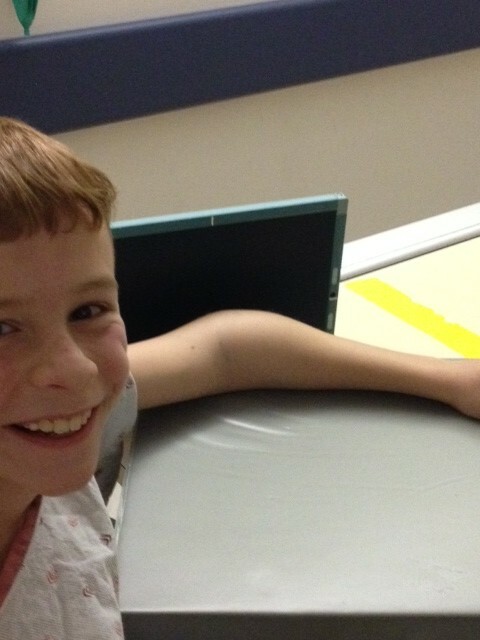 M-Man required surgery to place pins in his elbow as he damaged his growth plate. He’ll be in a cast for 4-6 weeks. 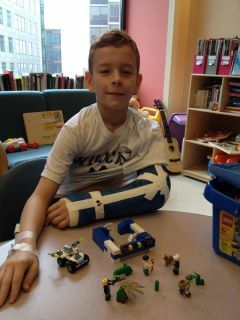 And even with a cast from his knuckles to his shoulder, M-Man still wants to play with LEGO. Our experiences the last few days reminded me of a few things. First, M-Man is just an AMAZING kid. Ok, I already knew that. But my time with him re-affirmed it! Although at first impact, I’m sure his pain was a 20 on a scale of 1-10, by the time we were asked at Urgent Care, he said it was an 8. By the time we reached Children’s Hospital, he said it was down to a 6. And after 5 hours in the Children’s ER, he stated it was a 4. And throughout the entire evening….throughout the entire 48 hour stay at Children’s….he was smiling the whole time. He was such a trooper. His spirit is awesome (and contagious). A total joy to be around and take care of. I am also extremely grateful to be living 20 minutes away from one of the best, if not THE BEST, Children’s Hospital in the world. The level of care and compassion is truly second to none. This is the third time (second for M-Man) that our children have had to go to Children’s. I have so much confidence in the expert care they provide. However, taking a trip to Children’s Hospital can be heart-wrenching–seeing so many children who are sick, or disabled, or need the specialized care that only Children’s can provide. It makes me appreciate so much that my children are strong, healthy, thriving children. THANK YOU GOD. The next few weeks should be interesting. But M-Man is young, healthy, drinks his milk. And with that great spirit, how could he not heal quickly? Because I documented my desire to return to work as well as the details of my job search, I figured I should write about my Return to Work Experience. Since December 12th, I have been working for a Social Service Agency who aids the Elder community. My title is HR Administrative Assistant, but my duties are much more of a Recruiting Coordinator. I am happy to report that I was actually able to find an organization that would let me work from 9am-3pm. For now, this is a temp assignment so it is offering me a “taste” of returning to work–to see how I like it, how I handle it, how it affects the family. I then went away for 10 days for the Christmas holidays, so I consider my “First Day of Real Work” as January 3rd. My supervisor had fixed the HRIS issue, so I now had the ability to go into the system and update evaluation dates, change of addresses, new job titles. I was also given the responsibility of handling all the job postings and resume intake, as well as meeting with candidates, sending out offer letters, and much more. There have been times when I have wondered if this is actually a 30 hour a week job. Either it is not, or I am too quick and efficient, or they just haven’t given me the “meat” of the job yet. I can’t say that I’m being “challenged” but I am feeling very productive. Luckily, over the past 2 weeks, I have been given more and more responsibility and autonomy. My supervisor and the HR Director are *very* pleased with the high level of detail and integrity I show in my work. I am constantly being complimented, and have been asked to extend my assignment from March until the end of May. How has my return to work effected our home life? Well, for starters, I haven’t heard any squawking from the peanut gallery. My morning routine with the boys is *exactly* the same. Lily and I take the boys to the bus stop each morning, and she and I go on a quick walk. Lily gets the raw deal, as her walks are quite short now, and she is home alone for 7 hours. The boys now take the bus after school, instead of my picking them up. When the boys come into the house, they grab a snack and start their homework. On occasion, I have to remind them that their “unwind” time was the 30 minute bus ride. And each night, I make a nice dinner for the family–sometimes it’s casual, sometimes I go all out–just like before I worked. I have done a few 7pm grocery trips during the week, and I have done “full grocery runs” on either Saturday or Sunday. It doesn’t bother me all that much, but it’s definitely not the same as going to a nice, quiet, relatively-empty grocery store at 9am on a weekday. What I have noticed, and perhaps this does bother me a little, is that since January, I have done a ton of errands on Saturdays or Sundays in between basketball games, church, or other commitments. When I mentioned this to Hubby, he hasn’t noticed. But I guess this is the reality of a working mom. Although I am capable of doing more than just administrative assistant work, I am happy that I decided to re-join the workforce in this capacity. I will admit that I very much underestimated the changes–laws, technology, procedures–in the last 10 years. This has been a great refresher and tutorial all in one. I know I’m not “manager” material (yet), but I’m looking forward to a bigger challenge. The HR Director talked to me the other day about whether I would be interested in staying with the company on a “permanent” basis in a full-time role (the role/title/job description is still being ironed out). As flattered as I was, I had to turn down her offer because I *really* don’t want to work 40 hours. I can’t tell you how much I have enjoyed filling 6 hours of my day with work I enjoy doing, being part of a team, being appreciated….but still able to come home, meet my boys at the bus, help them with their homework, and make a nice meal where we all sit together and share our stories of the day. I don’t want to give that up. I’m very fortunate to be in a position that I don’t have to work 40 hours (or more). And as I told hubby recently, By me returning to work, I am not breaking the family. If anything, I am enhancing the family because it shows my kids that “Yes, mommies are smart too. They can work.” I’m not deserting them for a job. I want to work while they are at school/work, as not to break the balance or the FAMILY WE CREATED. I am fortunate to be working with 2 very lovely, dedicated ladies. I plan on working at this agency through the end of May, or longer if they need me. Maybe they’ll change their mind and want to offer me a perm PT position? If not, that’s ok. I have thoroughly loved this experience, the “taste” of returning to work. And I will know what I enjoy doing, and can focus on that, and find something that “fits”. This past week, I had 2 interviews (shocking, huh? )–both for PT HR Assistant positions. On Tuesday I was contacted by Staffing Company (whom I had spoken w/ back in Sept/Oct). They had a position in a nearby town. The company is a family run operation. The company has a Recruiter who handles all the hiring from point A to point Z, and a Payroll Person, but were looking for someone to take care of all the other HR Paperwork. This would be a temp-to-perm position. Staffing Company told me that they sent someone w/ 15 yrs of HR Experience, and the Company folk would say “Nope, Too much experience”….and hence, my resume was pulled up (the exact opposite!! HAHA!). The interview (on Wednesday) went GREAT! I was “ON.” I liked the small office feel, got along great w/ the president and VP whom I interviewed with. I was told they were looking to make a decision by Friday, so someone could start next week. Also on Tuesday, I found a posting on Craigslist for a PT HR Assistant position through HR Staffing Company (one that I had been “afraid” to contact due to my bad experience with the snooty HR Staffing Company). The position is only a 2-3 month contract position, someone to do the paperwork while they find a new HR Manager (one recently left…”it didn’t work”). Instead of emailing my resume, I called HR Staffing directly. (BTW, I contacted them 10 minutes after the posting was placed on CL!). I was put through to the recruiter’s VM. HR Recruiter called me back w/in 30 minutes. We went over my background, she wanted me to add a couple of things to my resume, and she was excited (!) to pass my resume along to her client, which is a local non-profit agency. She scheduled an interview for Friday, and she wanted to meet with me in person, at a coffee shop near her client (meet me F2F to make sure I was presentable, I guess!). HR Recruiter and I hit off so well. She was understanding, supportive, excited for me….my cheerleader. For a couple days, I was going back and forth with hypotheticals–aka, what if both companies wanted to hire me, which would I choose? They both paid the same, both positions were nearly identical, the commute is nearly identical, I felt comfortable with both sets of people/offices. It came down to: TEMP or TEMP-PERM. With the temp job, it would be a good “feeler” for returning to work–for me, the boys, and especially Hubby. And it would provide me with “recent” experience to put on my resume. But, I would be back in the “job hunt” in a couple of months. Anyway, the interview on Friday also went well. I called HR Recruiter after the interview to tell her how it went. She sounded excited, and said she would send an email to her client to get their feedback. Within 10 minutes she called me and said I got the job, if I wanted it! I said YES–primarily for the reasons stated above, but also because I felt that HR Recruiter and I established a relationship and she went to bat for me, which I very much appreciated. Starting this week, I will be a (temp) HR Assistant at a local non-profit!!! The hours are 9am-3pm, so our lives shouldn’t be too much out of balance. I am super excited. As are my boys! Hubby seems supportive too. I can’t wait….and I will keep you posted on how things go!